This journal number consist of 12 scientific articles which are presented by researchers from UK, Norway, Switzerland, Cyprus, Jordan, Ukraine, Slovakia, Russia, Poland and Lithuania. Scientists have analyzed economic security enhancement relations, investment in high technologies, opportunities for improving product competitiveness, a cost-effectiveness issues in agricultural supply chain marketing, barriers and opportunities for small business development in rural areas,and other topical scientific and practical issues of today. 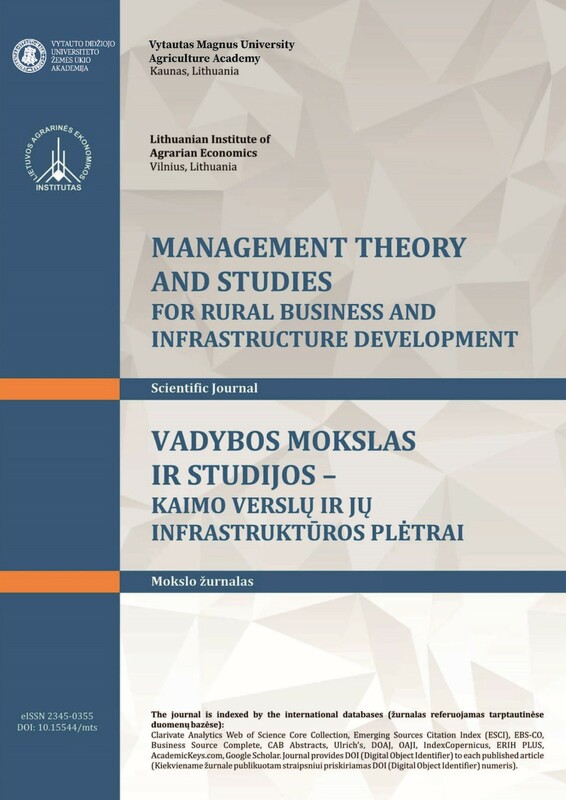 Management Theory and Studies for Rural Business and Infrastructure Development is the international, peer-reviewed scientific journal is published by Aleksandras Stulginskis University and Lithuanian Institute of Agrarian Economic, the leading institutions of research in agricultural & rural business management and economics in Lithuania. The aim of the journal is to promote exchange in scientific knowledge by publishing scientific articles in social sciences areas: management and administration, business studies, public administration, economic, as well as application oriented, practically and / or theoretically associated with the countryside, agriculture and its infrastructure. There could be also published theoretical articles in the previous mentioned fields.